This is a scalable context timeline. It contains events related to the event April 2, 1992 and After: Future Oklahoma City Bomber Renounces US Citizenship as Part of ‘Patriot Movement’. You can narrow or broaden the context of this timeline by adjusting the zoom level. The lower the scale, the more relevant the items on average will be, while the higher the scale, the less relevant the items, on average, will be. Anti-Government, Anti-Tax Ideology - The Posse Comitatus believes that the federal and state governments are inherently illegal and have no authority whatsoever; the highest elected official of the land, it says, is the county sheriff, who can form juries and call out “posses” of citizens to enforce the law as necessary. The movement strongly opposes paying taxes, particularly to the Internal Revenue Service (IRS), and considers money issued by the Federal Reserve System as illegal. It says that the Constitution’s 16th Amendment, which gave Congress the right to tax citizens’ incomes, was illegally ratified and therefore unconstitutional; moreover, it says, careful examination of federal law tells it that income taxes are entirely voluntary. The Federal Reserve System is, as one Posse publication puts it, “a private monopoly which neither the people nor the states authorized in the Constitution.” The Federal Reserve’s printed money violates the Constitution. Some, but not all, Posse Comitatus members also express racist and separatist views similar to those of Christian Identity believers (see 1960s and After); these members say that the Federal Reserve is controlled by a small cabal of international Jewish bankers who intend to destroy the American economy. [Mark Pitcavage, 5/6/1996; US Constitution: Sixteenth Amendment, 2011; Anti-Defamation League, 2011] Posse Comitatus members use the threat of violence, and sometimes actual violence, to express their anti-tax and anti-government ideologies (see 1972 and 1974). Township Movement - The Posse spawns a directly related ideology, the “township movement,” led in part by Utah resident Walt P. Mann. Township advocates advocate setting up small sovereign communities that are answerable only to themselves. The Posse will set up a “constitutional township” on a 1,400-acre plot in Wisconsin and name it “Tigerton Dells,” posting signs that say, “Federal Agents Keep out; Survivors will be Prosecuted.” Tigerton Dells will appoint its own judges and foreign ambassadors before federal authorities seize the property (see 1984). Inspiration to Other Groups - The Posse Comitatus’s ideology will inspire other anti-government groups, such as the Montana Freemen (see 1993-1994). 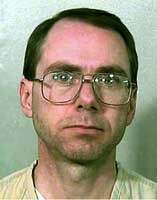 James Nichols, a Michigan farmer, anti-government white separatist, and the brother of Terry Nichols (see March 24, 1988 - Late 1990), formulates a plan to use a “megabomb” to destroy an Oklahoma City federal building; an unnamed FBI informant will later tell the FBI that James Nichols specifically indicates the Murrah Federal Building. Nichols, who says he is upset over the US’s “role” in the terrorist bombing of Pan Am Flight 103, shares the plan with the informant, who will swear to the information in 1995, after James’s brother Terry Nichols is arrested for helping destroy the Murrah Building (see 8:35 a.m. - 9:02 a.m. April 19, 1995). “[James] Nichols… made a specific reference to a federal building in Oklahoma City and began looking through the toolshed and workbench for a newspaper clipping depicting the Oklahoma City building,” the informant will say, according to an FBI affidavit. Nichols is unable to find the newspaper clipping, the informant will say, and instead draws a diagram remarkably similar to the Murrah Building. Nichols “later located a newspaper article containing a reference to the Federal Building in Oklahoma City and showed it” to the informer, the affidavit says. The informer is a regular visitor to the Nichols farm. [New York Times, 6/13/1995; Nicole Nichols, 2003] James Nichols routinely stamps US currency with red ink in a protest against the government, and calls his neighbors “sheeple” for obeying authority “like livestock.” A neighbor, Dan Stomber, will recall Nichols criticizing him and others for using drivers’ licences and Social Security cards, and for voting and paying taxes. “He said we were all puppets and sheeple,” Stomber will tell a reporter. “That was the first time I ever heard that word.” Stomber will not recall Nichols discussing any plans to bomb any federal buildings. [New York Times, 4/24/1995] After the Oklahoma City bombing, a friend of Nichols, an Indiana seed dealer named Dave Shafer, will tell authorities that Nichols showed him a diagram of a building remarkably similar to the Murrah Building, still under construction at the time, and said that building would be an excellent target. Shafer will say that he thought Nichols was joking. [Serrano, 1998, pp. 110] It is possible that Shafer and the unnamed FBI informant are the same person. Five years ago, a group of white supremacists had conceived of a plan to destroy the Murrah Building (see 1983). Former Army soldier Timothy McVeigh (see January - March 1991 and After and November 1991 - Summer 1992) makes what apparently is his first visit to Decker, Michigan, to visit his Army friend Terry Nichols (see March 24, 1988 - Late 1990). It is the first of many visits between McVeigh and Nichols. [PBS Frontline, 1/22/1996] McVeigh has quit his job as a security guard in upstate New York (see June 1992), and is beginning a life of long, solitary drives around the country, supporting himself by selling and trading guns and materiel (including ammunition, blast simulators, and even atropine, an antidote to chemical warfare) at gun shows. He tells friends that one reason he has chosen to leave his home of New York State behind is because of its “out of control” welfare and social services programs and high taxation. McVeigh does a brisk business buying and selling anti-government propaganda and manuals teaching the reader to build homemade bombs and survival techniques. [Stickney, 1996, pp. 143-144; Serrano, 1998, pp. 55-57] McVeigh and Nichols share a virulent hatred of the federal government and other right-wing views (see April 2, 1992 and After). 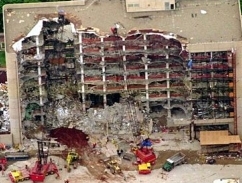 They will soon begin a conspiracy that will culminate in the bombing of a federal building in Oklahoma City (see 8:35 a.m. - 9:02 a.m. April 19, 1995). Terry Nichols (see March 24, 1988 - Late 1990, December 22 or 23, 1988, and October 12, 1993 - January 1994), who has temporarily left his wife on his brother’s farm in Michigan after the tragic death of their young son (see November 22, 1993), is doing well as a ranch hand in Marion, Kansas (see February - September 30, 1994). The ranch owner, James C. Donahue, will later recall Nichols as a hard-working and reliable man, but somewhat odd in his political views. On March 16, Nichols submits an affidavit to the Marion County Attorney seeking to be relieved of the jurisdiction of the federal government; Nichols has once before attempted to renounce his US citizenship (see April 2, 1992 and After). The County Attorney will later say he “put it in my weirdos file.” Later this summer, Nichols will be visited by his old Army friend and ex-roommate Timothy McVeigh (see November 1991 - Summer 1992, February - July 1994, and 8:35 a.m. - 9:02 a.m. April 19, 1995). McVeigh will spend several days on Donahue’s ranch in September helping Nichols move out. [New York Times, 5/28/1995; PBS Frontline, 1/22/1996] Donahue’s son Tim, who is Nichols’s supervisor on the ranch, will later tell investigators that Nichols has become increasingly vehement in his anti-government rhetoric, and becomes more so as time goes on. “[H]e often talked about government being too big and too much power, and that he felt that the government needed to be overthrown and that Thomas Jefferson had written that it was our duty to overthrow the government when it did get too powerful.” [New York Times, 12/24/1997] Nichols will later take part in the Oklahoma City bombing with McVeigh (see 8:35 a.m. - 9:02 a.m. April 19, 1995).